SUPPORT FARM RESCUE WITH YOUR NEXT ONLINE ORDER! You can now help us assist more farm and ranch families during times of unexpected crises by utilizing the links on this page when purchasing items from Amazon or Walmart. 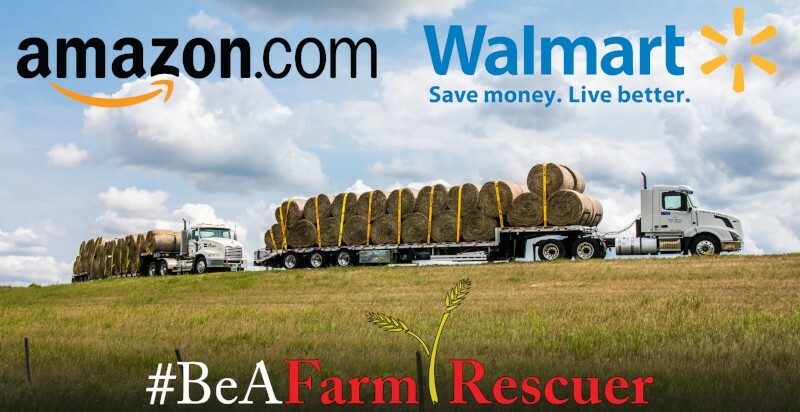 Farm Rescue is approved by AMAZON and WALMART to receive a percentage of the total dollar amount from purchases completed through the Farm Rescue page. The links are safe and secure, since your purchases are completed on the website of Amazon or Walmart. There is no additional cost to any items purchased. Your online shopping is the same as always, except now you're helping Farm Rescue to assist more families! Browse the PRINT and CLOTHING sections below to view items available for purchase. If you are looking for the "Beautiful Hands of a Farmer" print, Farm Rescue Cookbook, or the Farm Rescue DVD, you will find them under PRINT. If you need a new Farm Rescue shirt or cap, they are located under CLOTHING. All proceeds benefit Farm Rescue operations!